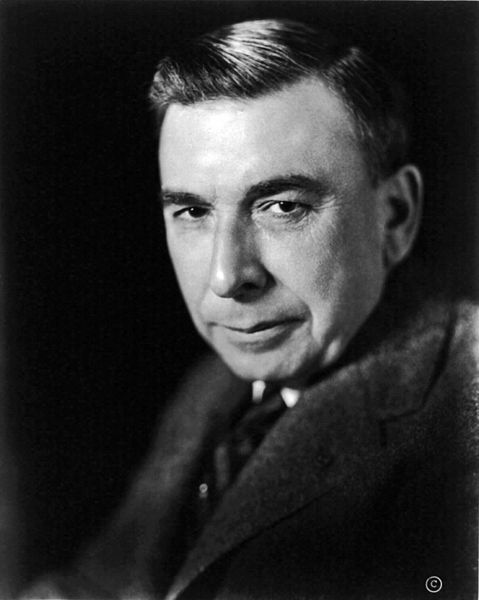 Newton Booth Tarkington (1869-1946) was born, lived, and set most of his works in Indiana. He was the offspring of old American families: His father’s side of the family moved to Indiana from the south in the late eighteenth century, and his mother’s family in New England could be traced back to colonial days and still held prominent positions in society and politics (in fact, Booth was named after his uncle, Newton Booth, then governor of California). During his youth, his family was one of many who fell into financial hardship. They managed to hold on, and Tarkington was educated at Purdue and later Princeton University. He became a rather successful playwright and novelist, his first novel, The Gentlemen from Indiana, being published in 1899. But it was not until a divorce and his marriage to Susanah Robinson in 1912 that he entered what biographer James Woodress called his “major phase.” The first novel of this phase was 1915’s The Turmoil, the first volume of what became known as Tarkington’s Growth trilogy, including his Pulitzer-prize winning novel, The Magnificent Ambersons (1918). Tarkington was the first author to win two Pulitzer prizes for fiction (the second was for 1921’s Alice Adams), a feat that has only been duplicated by John Updike and William Faulkner. The Turmoil tells the story of the nouveau riche Sheridan family, led by the consummate industrialist, Jim Sheridan. The main character is the family’s youngest son, twenty-two year old Bibbs Sheridan, who at the beginning of the novel is returning from a sanitarium after two years spent recovering from a nervous breakdown brought on by his father’s attempt to mold Bibbs after his own image (as he had successfully done with Bibbs’ two older brothers). The novel’s main focus is on the relationship between Jim and his children and the relationship between the Sheridan’s and the “old rich” families of Indianapolis, specifically the secretly destitute Vertreeses and their daughter Mary, and how these things affect Bibbs’ personal growth. Therein lies the heart of the novel: Bibbs, the dreamer, poet, and outsider, assuming his maturity in a changing world. Tarkington creates an honest picture of an isolated young man with vague ambition and his transformation as he reenters the world and falls for Mary Vertrees. The story is often funny and, on a few occasions, tragic, as the lives of all the characters drastically change. Besides Bibbs and Mary Vertrees, the characters are often typecast so as to parody certain kinds of people or situations. That is not to say that they don’t have depth (although there are a few characters who don’t), and this parody is intended and generally succeeds in being humorous. And when the characters examine the reasons behind their behavior, or break from their established caricatures, it is done skillfully, giving the reader a deeper understanding of their personalities. Overall, The Turmoil has aged well. The relationships between the members of the Sheridan family are true to life and easily accessible, even after all this time. However, the attitudes the characters hold in regard to romantic relationships and the old wealth vs. new wealth are strictly representative of their time. So why was it so popular? The industrialization of the Midwest affected many people, including Tarkington. According to his biography: “The sedate, well-mannered, and self-contained society that he rememberd in Indianapolis in 1900 had crumbled before the irresistible force of big business and the vast complexities of an industrial democracy. The life he formerly knew had been succeeded by a frenetic rat race in the grimy maze of his once relaxed and friendly city (Woodress 181-2). That’s a good question. At the time of writing this, I’ve already finished reading Tarkington’s Seventeen (the bestseller of 1916). Judging from these two (very different) novels, I feel that the reason is that they are very much period pieces. Obviously, much fiction takes place at the time it was written, and that time is from a past period, but that is not what I mean by “period piece.” As I define it, a period piece is a story in which the attitudes of the characters are deeply entrenched in that specific time and place. For example, if we look at Joseph Conrad’s Heart of Darkness and the film adaptation Apocalypse Now, even with the change in the specifics of the setting (replace colonized Congo with occupied Vietnam, mercantile with military), the characters’ attitudes and values are not anachronistic. The same cannot be said of Tarkington’s characters. The characters are still accessible and coherent, but they can only be understood as products of their time. If you don’t mind period pieces, then yes. The Turmoil is fun, emotional, and well-written. You can read The Turmoil on Project Gutenberg. Churchill, Winston. The Inside of the Cup. 1913. Tarkington, Booth. The Turmoil. 1915. Woodress, James. Booth Tarkington: Gentleman from Indiana. New York: J. B. Lippincott. 1955. Like the concept of your blog, Matt. Of course the literary quality of the works you will be reading is all over the map, from very high (Steinbeck) to fairly dismal (the seventies has some clunkers). But I like the idea of putting works in their historical context, and perhaps touting works that deserve a look that have been forgotten. I envy you the time to read and respond and wish you luck. Hi Matt, I finished reading "The Turmoil". I took your suggestion and skipped "The Eyes of the World". I though "The Turmoil" was pretty good. I could see it as a 1930's movie with maybe Fred Astair as Bibbs. This and "The Inside of the Cup" were both set in some unnamed mid-western city. The common theme was the air pollution. It was sort of a back ground nuisance in "Cup" but it was practically a main character in "Turmoil".